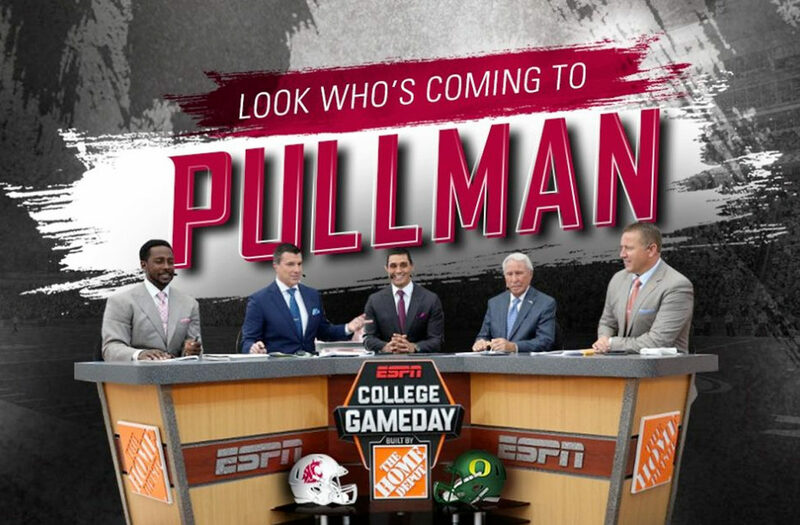 ESPN College GameDay is set to broadcast its next show live from the Pullman campus, 6‑9 a.m. Saturday, Oct. 20. The three-hour show features interviews, analysis of the day’s college football games, and highlights of the fans and hosting campus. The WSU Cougars will be playing the Oregon Ducks, with kickoff set at 4:30 p.m. PT in Martin Stadium. The Cougars are currently 5‑1 for the season, having beat Wyoming, 41‑19; San Jose State, 31‑0; Eastern Washington University, 59‑24; Utah, 28‑24; and Oregon State, 56‑37. Its sole loss was a close matchup against USC 36‑39. For details see the WSU Cougars website. Oregon also is 5‑1 for the season, having beat Bowling Green, 58‑24; Portland State, 62‑14; San Jose State, 35‑22; California Berkeley, 42‑24; and Washington, 30‑27. Its loss came against Stanford, 31‑38. The Pac-12 North Division rankings show Washington, Oregon and Washington State at 1-2-3, respectively. The original GameDay announcement came Saturday night by ESPN’s Kirk Herbstreit. Details and logistics of GameDay’s visit to the Pullman campus are still under development and will be released soon.